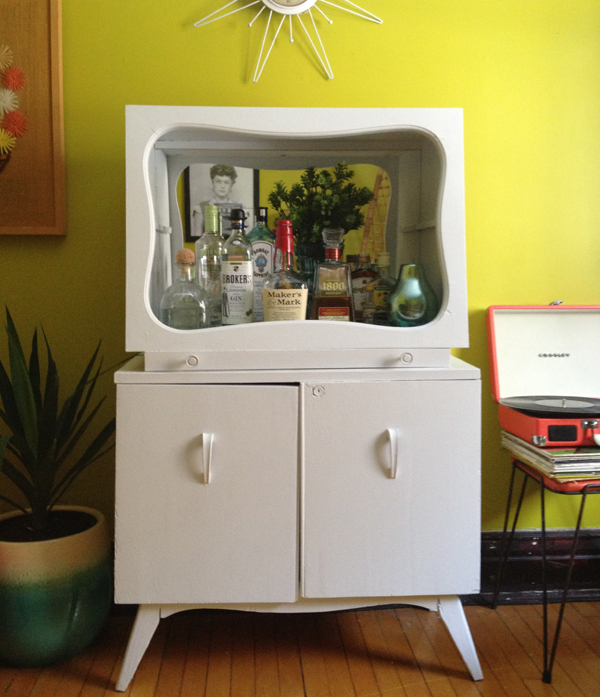 Oh So Lovely Vintage: My vintage bar/cabinet makeover! 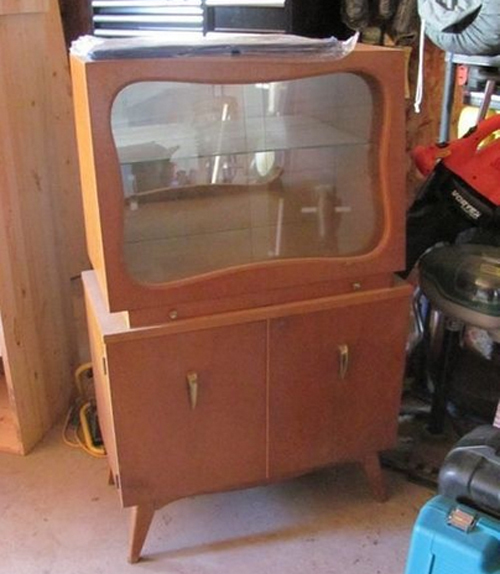 So I have a good story behind this vintage cabinet. It all started in the Summer when I saw this ad go up on kijiji (Canada's version of Craigslist). I instantly fell in love and knew it had to be mine! I immediately picked up the phone and called the number, but unfortunately the guy was just loading it onto someone's truck. It was sold. 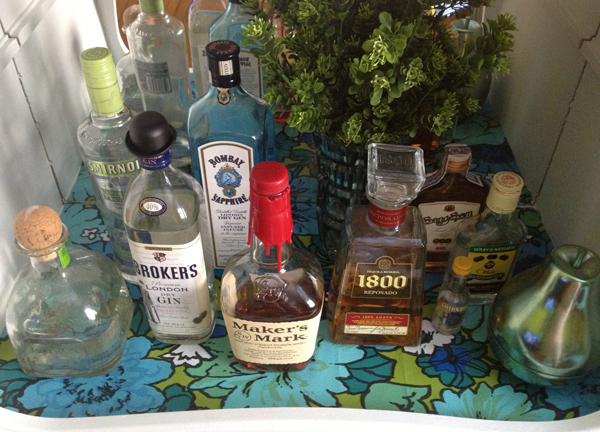 I don't know why, but I had an urge to put the photo of the bar on pinterest because I had never seen anything like it. A few weeks passed and I got a random email from a woman who lives in Winnipeg and had even been in my shop before! Low and behold, she follows Stef and I on pinterest, saw the pin and had the exact one sitting in her garage that I could buy! My mouth literally dropped to the floor. Seriously, what are the chances? I went and picked it up that same day and it was even cheaper than the first one I fell in love with! I took it home and have loved it ever since. Well, as good as that story is, it gets even better! A few weeks after I took it home I was working at the shop and one of our regular customers who has an incredible collection of 50's and 60's furniture and knick knacks came in and we got to talking and he asked if I had found anything interesting lately. I quickly pulled up the photo on pinterest and his mouth dropped. It had been his ad on kijiji! When I called about it, it was him that I had spoken with! We had a pretty good chuckle about it, and he was so happy that I ended up finding one just like it! 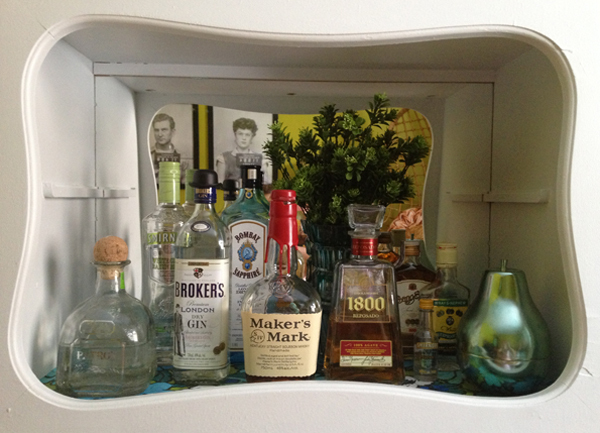 On that note, let me show you the cabinet! So this is what it looked like when I first brought her home. Sorry for the poor photo! This is what she looks like now! I'm thrilled with the way it turned out! First I stripped it down, took out the sliding glass doors, sanded the whole thing down and then did one coat of an oil primer. Once that dried I did two coats of white paint. The left door is a little bit crooked, but I like that it doesn't look perfect! After everything was dried, I measured the inside and cut a piece of vintage floral vinyl I had been saving for just this kind of occasion! Ta-da! What do you think? Have you done any fun make-overs to something in your home? That is awesome! I love it! And a great story, no less. That cabinet is fantastic! I only wish I could find amazing furniture like that in Ireland! Cabinet is amazing! I love kijiji. I got a dresser and desk and did a DIY mod podge. Love what you can find on kijiji! Wow, what a great idea! You did a fantastic job on it! This is adorable! You did a great job and I love the story behind this vintage find. I guess it's a good idea to make your wishes known! how adorable did that turn out. It was totally meant to be. I could have me a few martini's from that bar! I really like it in color. It didn't look as good to me on the before. It looks awesome now. Well, I do like the cabinet but you should have never painted it! 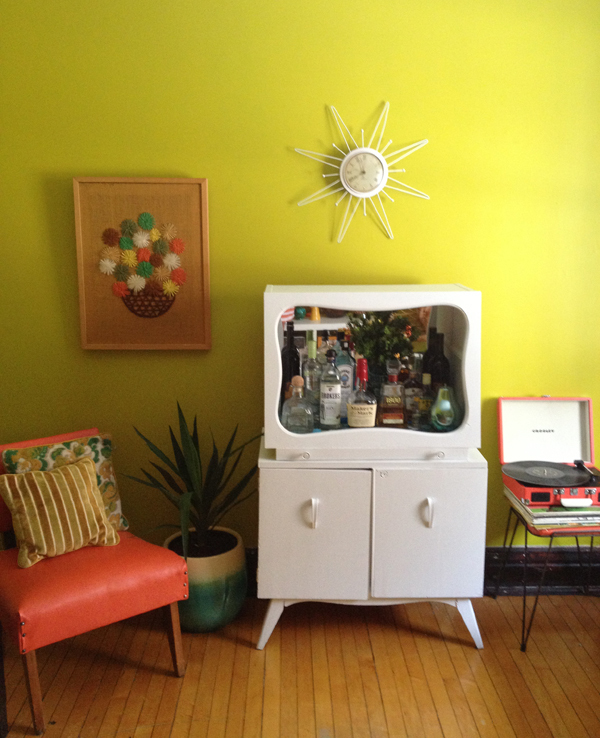 I think it is so sad when people take an original 40-60´s furniture an paint it white or in any other color. I prefer it original! I get so busy in the makeover process that I never take any photos! Love this transformation. The vintage glasses are to die for! Its great! 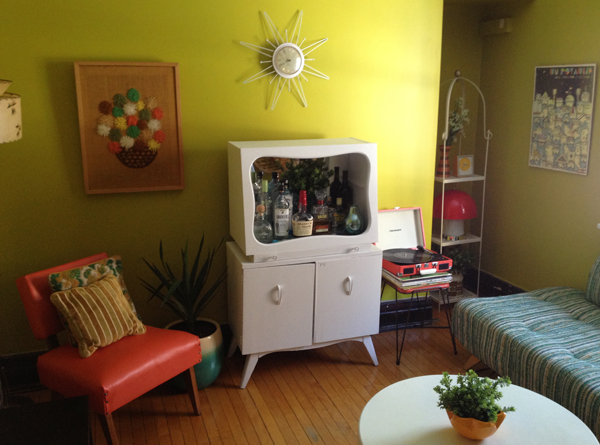 I wish I could find cool vintage furniture on craigslist in st.louis! Love it, and love your rooms! 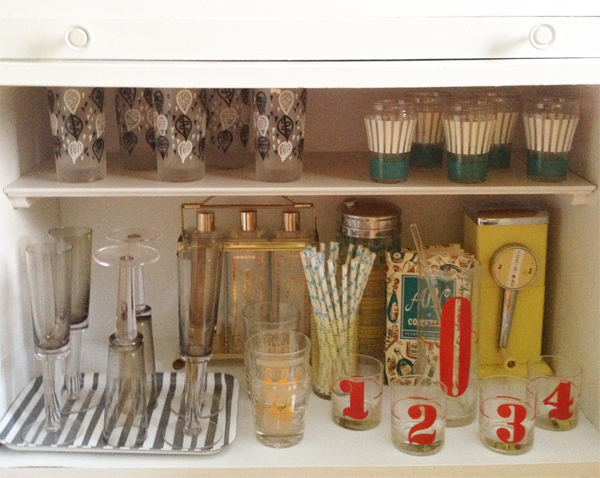 Love the makeover you did and your barware! That's so awesome you were able to find the same one again! So perfect!!!! This piece was a great find! Love it, want one! Trying to source similar but they are all too 'square' the ones I see on the 2nd hand website!! boo hoo.. Honestly it is a wonderful piece and you did an amazing job, but why on earth would you put the liquor and spirits in the top. They are not even a quarter as pretty as your glass and stem ware. Put that glass shelf back in the top and put those glasses so everyone can see your gorgeous collection! You did such a great job, and then totally botched the display part! Hi there. I thought I would respond to your kind of rude comment...I realize everyone is entitled to their own opinion, but this is how I chose to display it. I personally love the way the liquor looks up top! I tried putting it in the bottom, but most of the bottles did not fit. I will move things around in the future, but as of right now I love the way it is. Love synchronicities . . . they make life so magical! 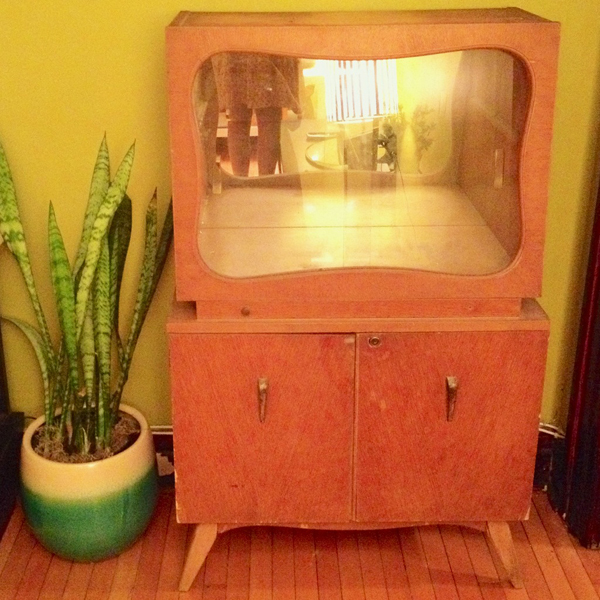 Also love how the top of your cabinet resembles an old TV, complete with dials. Tune in for cocktails! That's really lovely..I'm happy how things turned out. Lucky you - loving the furniture! 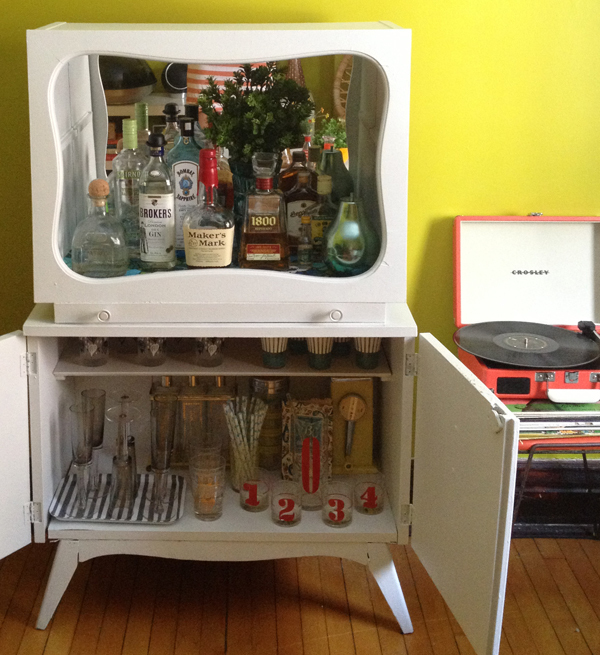 My loverboy and I also have a vintage bar in our living room. It was nice to see someone else's take on them. This is sooo cute. I ended up making one similar for my living room. I was sad that it didn't turn out anywhere as cute as yours. That is beautiful, how much was it on Kijiji for? I have one for sale if anyone is interested.